My cocktail selection right off the bat was the French 75 (Beefeater gin, Curacao d’Orange, Citrus, Sparkling wine) for $15, pretty standard pricing for cocktails these days at a fine dining restaurant. 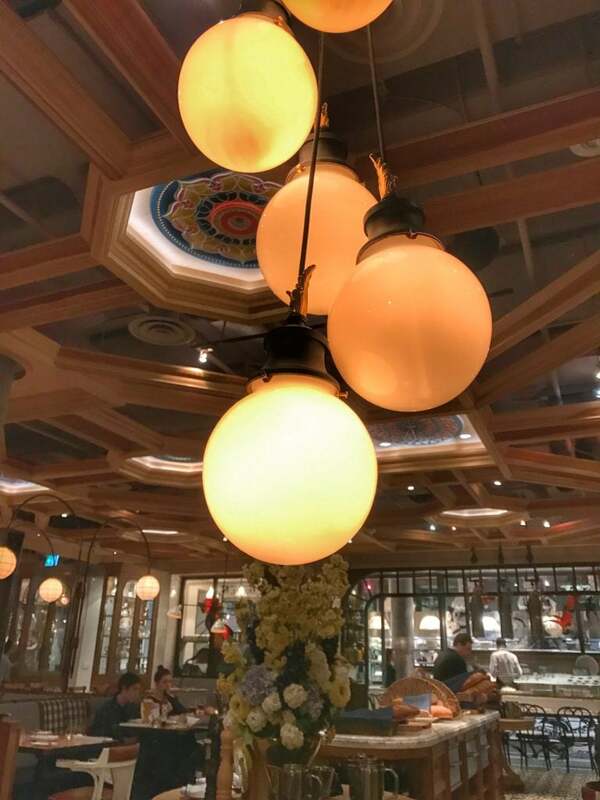 The cocktail was executed well and fit with the traditional bistro feel of the restaurant. 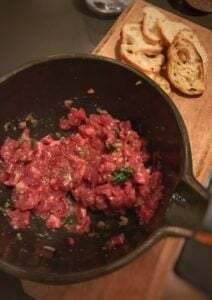 To start our meal we ordered the table side beef tartare, with the works (shallots, egg, seasoning), and crisp Cluny baguette for $14.90cdn. This was one of the best beef tartare’s I’ve ever had. Perfectly seasoned, each mouthful was a delicate burst of flavour. 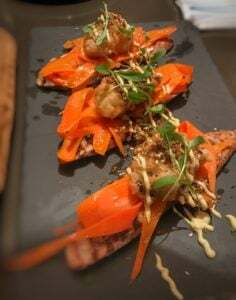 Also to start we had the fried oyster, crispy west coast oysters, smoked carrots, creme fraiche, bagel crumbs, and pistachio emulsion for $13.90cdn. This dish was also a slam hit, I felt like the combination of ingredients emanated an almost moroccan feeling to the taste, a lovely surprise. As my main I ordered the duck confit pot pie, house made andouille sausage, bone marrow, fall root vegetables for $30.90cdn. Unfortunately this was a bit of a disappointment. 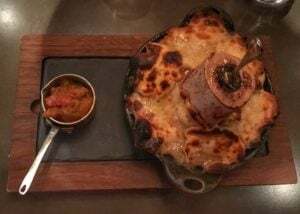 It was hard to spot the duck in the dish and what pieces I did find I couldn’t taste as the flavoring of the andouille sausage overwhelmed everything else. 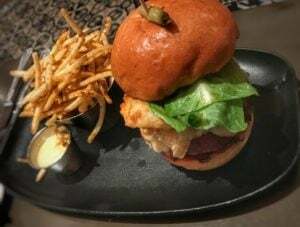 One of my companions ordered the Cluny double bacon cheese burger, organic Ontario beef, double smoked bacon, smoked cheddar cheese, chicherons, and frites for $24.50cdn. As a whole the dish was good but when you tried tasting the patty on it’s own, it had little to no seasoning. 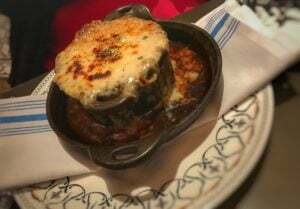 My other companion decided to go with two starters as her entrees, the melted gruyère, served french onion soup style, glazed onions, and rich beef broth for $15.90cdn. No disappointment here, was a well executed french onion soup. 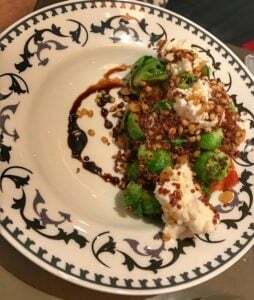 Her other selection was the brussel sprout and whole grain salad, buffalo milk ricotta, quinoa, wheat berry, and quince jelly for $12.90cdn, also satisfactory. To end our meal we had to try something sweet. 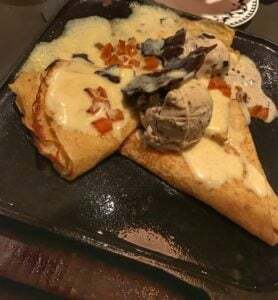 We decided on the grilled vanilla crêpe flambé to share, chocolate crumble, candied orange, and cookies and cream ice cream for $23.90cdn. This was not only a show to watch but an absolutely delightful end to the meal. After an excellent start to the mean with the superb starters, the entrees really fell flat which was a disappointment, thankfully the lovely dessert picked up the mood again. 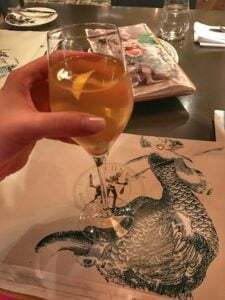 Honestly I would go to Cluny again but for me it will be more of a bar experience. I would like to order cocktails and just munch on their starters which were proven to be home runs. 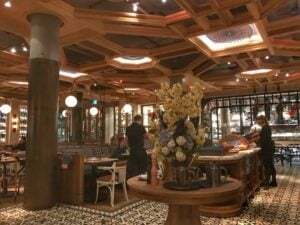 For additional information about Cluny and to make reservations, visit their website HERE.